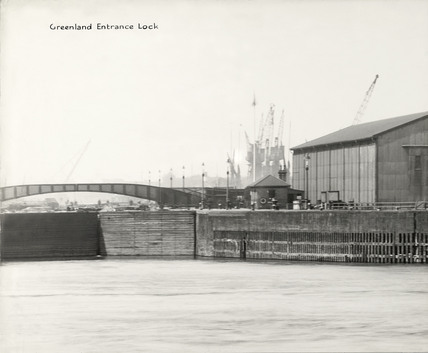 Thames Riverscape showing Greenland Entrance Dock from the Greenland Entrance Lock to Durand's Wharf section of the south bank of the Thames. 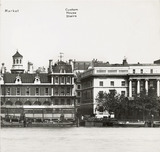 In 1937 the Port of London Authority commissioned Avery Illustrations to document both banks of the Thames between London Bridge and Greenwich/Island Gardens. The result was a total of 276 black & white photographic prints, 124 for the North Bank and 132 for the South Bank. 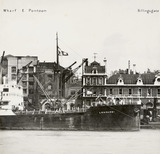 Joined together the prints form 2 panoramas that depict the busy working warehouses, factories, ships, tugs and barges that inhabited the banks of the Thames.